The value stream mapping is a tool that helps us to see and understand a process and identify its waste. It allows to detect sources of competitive advantage, helps to establish a common language among all users and communicates ideas for improvement. Focus on the use of a plan prioritizing improvement efforts. A value flow shows the sequence and movement of what the customer values. It includes the materials, information and processes that contribute to obtain what the client is interested in and purchases. It is the technique of drawing a map or flow diagram, showing how materials and information flow from the supplier to the client and seeks to reduce and eliminate waste. It is useful for strategic planning and change management. 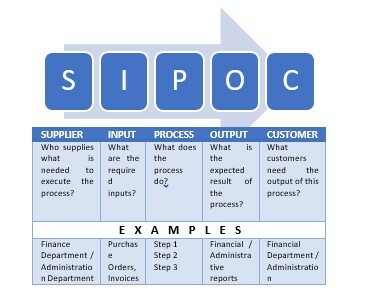 At present there are different formats of flow diagrams, for example: Turtle, Octopus, SIPOC (Supplier, Input, Process, Output, Customer), the latter being one of the most used. By didactic facility it can be used as the starting base of the elaboration of VSM, since it shows all the elements in a simple form that will be used in VSM and that avoids leaving any of them last. b) Financial conditions of the product line that contributes with a higher percentage in revenues. c) Based on developing a line of products that is having a greater boom in the market within the range of processes that are managed and that could be provided could modify the income structure. d) Some other aspect of high relevance for the Management. Even though this tool originated to be used in manufacturing processes, it is widely used in administrative processes. The activities that add real added value are those that the client is willing to pay, are those that are waiting to satisfy your requirement and solve your need. There are many other activities that the production or service company requires and are necessary for their internal operation, but that do not add value from the point of view of the advantages for the client (activities that do not provide added value to the client). These activities should be reduced to the maximum without affecting the internal policies of the company or revising the latter to improve them and be more competitive. In addition, there are other activities that do not add any value to the client or are essential to the company and are a real waste of resources, these should be eliminated as soon as possible. All systems are perfectible and the objective sought by companies is to achieve only what is necessary with the quality that the customer expects in the shortest time possible. What moves the strengthened LEAN companies, is to only give what the client is willing to pay, if it detects any additional benefit that can be sold even for a stratum of the market and is profitable without affecting the whole on the one hand. The elimination and reduction of waste leads to maximize competitive advantages within the company looking for more competitive, this was systematically initiated in the 80s in TOYOTA by Taiichi Ohno and Shingeo. Focusing primarily on greater productivity, reducing waste and making better use of the few available resources available in all companies. The seven most commonly accepted waste in the production system are: Overproduction, Wait, Transport, Inadequate Processes, Unnecessary Inventories, Defects and Movement. It is important to mention that the biggest waste that can exist and is not enumerated is the Waste of Talent, Human Capacity and Productivity, since the most valuable resource that any company can have is the human team that manages to integrate. Should be avoided the underutilization of creativity, and promote innovation and continuous improvement. Especially the innate human talent that counts from the worker to the CEO based on 80% of the talent developed based on perspiration and 20% inspiration, and can follow numerous paths to avoid waste. a. Different types of waste. b. Clearly differentiate the types of activities from the client’s perspective (Value added, Necessary, Negotiable, No added value, Waste). c. Simplified general review of LEAN thinking. d. How to classify and select Product Families. 2. Once the selected team knows the procedure to follow, they should walk several times along the entire value chain that will be mapped, from start to finish; that is, from the entrance door of the raw materials of the suppliers to the exit door of the products to the client, seeing all the details of the process including possible errors of the operation. 3. Select one of the criteria that can be used to group products when there is a very large gamma of them. It is recommended to apply the Pareto rule (20% of the process types handle 80% of the products, 20% of the clients consume 80% of a product, or a similar concept) for when the number of criteria and possible family is high. With which allows us to have a better visualization of the most convenient family to use in our mapping. 4. The Map should be limited to only one family of products. Choose the family of products that have a greater impact on business requirements, preferably having a minimum common flow of 70% and / or a Takt Time much greater than 35 seconds. Preferably it is sought that there are not many types of products in the family to facilitate the mapping, especially the first times that this tool is used. Being convenient that the product family is of high volume and / or frequency. A family is a group of products that pass through similar processes and teams in common. A large number of authors do not recommend grouping product families by looking at the stages through which manufacturing waters pass.